Chinese Tea Eggs is an Asian savoury snack, originated from China. What are Chinese Tea Eggs? They are hard-boiled eggs, with cracked shells still intact, simmered in a black tea and spice mixture for a few hours until the flavours and fragrance from the tea mixture has flavoured the eggs. Nowadays, Chinese Tea Eggs can be found throughout Asia and it is very common over here in Malaysia. I'm sure many of my Asian blogger friends are familiar with these Tea Eggs, and a favorite of many! For my other friends who has not heard or seen of Chinese Tea Eggs before, it is a savory snack that can be eaten anytime of the day. Very easy to make and delicious to eat. Over here in Malaysia, when one goes shopping in a shopping complex, sometimes you can smell the wonderful fragrant aroma from the Chinese Tea Eggs. Just follow the smell, and it would lead you to a stall or shop that has a big pot of slow cooker, with dozens of simmering eggs bubbling in the tea mixture. Even though the Tea Eggs can be eaten cold, I love to eat it while it is still hot and fragrant. I used the slow cooker to simmer the eggs for a few hours. This slow cooker of mine has been with me for about 20 years now, and over the years, have faithfully simmered dozens of Chinese Tea Eggs! I would usually make the Tea Eggs as a weekend afternoon snack, and to give to a friend or a neighbour. You can use any Chinese black tea, for this I have used oolong tea leaves. Other ingredients used are cinnamon stick, star anise, ginger, Chinese rice wine, sugar and light soy sauce. The spices gave the wonderful fragrance to these eggs. There are many other versions to make the tea mixture, some recipes uses other spices like cracked white pepper, cloves and mandarin peel. I have added white cracked pepper before but have yet to try with mandarin peel. I have adapted the recipe below to simmer the eggs using the slow cooker for 3 hours. Firstly you have to boil the eggs to hard-boiled and cooked. Refresh the cooked eggs under cool running tap water. Next, make the cracks on the shell. I made the cracks by using the back of a spoon. Knock the back of a spoon against the shell of the hard-boiled eggs and make cracks all over (you don't have to be gentle! ), not just a few cracks, but make sure that the cracks are all over the egg and don't worry if the shells breaks a little. Do not remove the shell, as the cracks in the shell makes a very attractive marbling pattern on the eggs after simmering for a couple of hours in the tea mixture. Even though the shells can be removed before simmering in the tea mixture, it would not be so pretty and the eggs would look rather plain. Besides, the kids love it when they remove the shells themselves and find a very pretty looking egg inside! Make the tea mixture by mixing all the other ingredients in a pot and boil over medium-low heat for 20 minutes. Let it come to a full boil and pour the mixture into a slow cooker pot. Add in the eggs and set the slow cooker to high setting for 1 hour, and low setting for 2 hours. You may remove one or two eggs for your immediate consumption and keep the rest in the tea mixture until needed. You could however, chose to simmer the eggs in the tea mixture for 45 minutes to 1 hour, and letting the eggs steep in the mixture for a few hours until cold or even overnight. I have never tried this method before, as I have always use the slow cooker method of making these eggs. Once the eggs are done, let it cool a little, remove the shells and you can see the marbling patterns on the egg. Cut in half and eat it as it is, or spoon just a little of the tea mixture over the eggs, or if you like, eat with some light soy sauce. However, in my house, we do not cut the eggs in half, we eat it by holding the peeled eggs and biting off chunks and drizzle with some of soy sauce over each bite. (An already bitten egg is not a very pretty picture, hence the cut halves above!). The eggs are actually good enough to eat it on its own, without any additional sauce or dips. You need to plan ahead in order to enjoy these later, as it takes a few hours to simmer. The longer they are simmered in the tea mixture, the more flavourful the eggs will taste from all that spices and the black tea. But take note that, the perfect tea egg should have a perfect balance between the eggs' natural flavour and the spices. From my experiences, a few hours is just right, to get that balance. Simmering them too long, and the flavours from the spices and tea would dominate the flavours from the eggs, but then it really is a matter of preference. Place the eggs in a saucepan with enough cold water to cover. Bring the water to the boil, then reduce the heat to low and let the eggs simmer for 10 minutes, or until they are hard-boiled. Refresh the eggs in cold water. Drain the eggs and lightly tap and roll the shells on a hard surface to crack them. Do not remove the shells. Put the tea cooking mixture ingredients in a heavy-based clay pot, casserole or saucepan with 1 litre (4 cups) water and heat until boiling. Reduce the heat to low and simmer for 20 minutes. Add the cooked eggs and simmer for 45 minutes. Turn off the heat and let the eggs sit in the tea mixture until cool enough to handle. Remove the shells and serve the eggs warm or cold, cut into wedges, with some of the cooking mixture on top. After simmering the tea cooking mixture for 20 minutes, let it come to a boil and pour the mixture into the slow cooker pot. Add in the eggs. Turn heat to high and cook for 1 hour, and 2 more hours at low setting. Clearing my pantry : From my freezer, frozen blueberries. This cake was bookmarked ever since I started baking from this wonderful cookbook "The Weekend Baker" by Abigail Johnson Dodge together with my baking friends at Avid Baker's Challenge (ABC). Our baking group are no longer baking from this book, but I will be trying out most of the recipes from this book. Warm Cinnamon-Spiced Blueberry Cake, fresh from the oven. The blueberries are not mixed in together with the batter before baking as with most cakes, but are scattered over the top of the batter after the first 10 minutes of baking. The blueberries are first mixed with some sugar, flour and cinnamon, and crush lightly with a fork. This cake has a lovely brown soft crust and the blueberries are scattered all over. Some of the berries sunk to the bottom, while some are in the centre and some are right on the surface of the cake. The cake looks very nice with the scattering of blueberries on top. As usual, I have reduced the sugar and I'm so glad I did, it turned out with just the right amount of sweetness. And I have replaced the sour cream with homemade yoghurt. The cake itself has a very moist and soft texture with tender crumbs. A lovely cake with cinnamon fragrance bursting with juicy blueberries. If you have some frozen blueberries in your freezer, give this cake a try. Simply delightful with a cup of warm tea. Position an oven rack on the middle rung. Heat the oven to 350 degrees (180C). Lightly grease and flour the bottom and sides of a 9-by-2-inch round cake pan, tapping out the excess flour. (I line the bottom with parchment paper). In a medium bowl, combine the flour, baking powder, baking soda, cinnamon and salt. Whisk until well blended. In a large bowl, combine the butter and sugar. Beat with an electric mixer (stand mixer fitted with the paddle attachment or handheld mixer) on medium speed until well blended. Add the eggs one at a time and beat just until blended. Add the vanilla with the second egg. Using a rubber spatula, fold the dry ingredients into the butter mixture in 3 batches alternately with the sour cream, beginning and ending with the dry ingredients. Scrape the batter into the prepared pan and spread evenly. Bake for 10 minutes. As soon as you put the cake in the oven, make the topping. In a small bowl, combine the blueberries, sugar, flour and cinnamon. Mix the ingredients together with a fork, lightly crushing the blueberries. After the cake has baked for 10 minutes, sprinkle the topping evenly over the top of the cake. Continue baking until a toothpick or cake tester inserted in the center of the cake comes out clean, about 30 minutes longer. Transfer the cake to a rack to cool for 10 minutes. Run a knife around the inside edge of the pan to loosen the cake. Using a thick, dry dish towel to protect your hands, invert a large, flat plate on top of the cake pan and, holding both the pan and the plate, invert them together. Lift the pan off the cake. Invert a flat serving plate on the bottom of the cake and invert the cake one more time so that the blueberries are on top. Serve warm or at room temperature. Storage : Cover the cooled cake in plastic wrap and store at room temperature for up to 5 days. "Out of India", our theme for this week at I Heart Cooking Clubs (IHCC), where we are currently cooking with Madhur Jaffrey recipes. I have missed two weeks of cooking with IHCC as I was busy with the Chinese New Year preparations and holidays. Now that I'm back, I am looking forward to an Indian meal and was craving for some curry. Since the theme is "Out of India", I chose a "trip to Sri Lanka", with this dish Sri Lankan Curry with Coriander. The dry spices ; mustard seeds, coriander seeds, peppercorns and cloves are processed to fine powder. Shallots, ginger, garlic, fresh coriander and green chillies are blended with a little water to a smooth paste. Spices left whole are the cinnamon stick and cardamom, with some fresh curry leaves and pandan leaves. Here I have used low-fat coconut milk. I have doubled up on the spices since I've cooked about 650gm of pork meat. And have used only 60ml of the coconut milk. This is a fairly easy dish to cook. The braising of the meat takes only about an hour. The meat was ready tender and soft. This curry has a mild spiciness from the peppercorns and very fragrant from all the spices, curry leaves and pandanus leaves. A nice dish to accompany fluffy hot basmati rice. Comparing this pork curry to Red Pork Curry which I've made in December, I prefer the later, which I have cooked twice since then. We had this dish with Plain Basmati Rice and a vegetable dish, which I will be sharing next week. 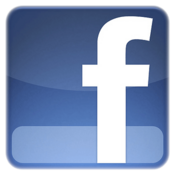 Please visit I Heart Cooking Clubs (IHCC) to view other interesting and delicious dishes that the others have made. Put 2 teaspoons mustard seeds, 1/2 teaspoon peppercorns, 3 tablespoons coriander seeds and 2 cloves into a clean coffee grinder or other spice grinder. Grind as finely as possible. Chop the shallots, ginger, garlic and coriander and put them into a blender along with the chilli and 5 tablespoons water. Blend, pushing down as many times as needed with a rubber spatula, until you have a smooth puree. Pour 3 tablespoons oil into a large non-stick, lidded pan and set over a medium-high heat. 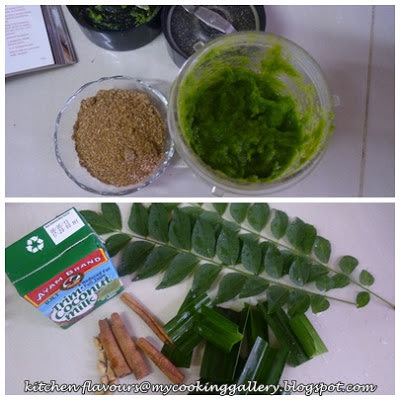 When the oil is hot, add the cinnamon, cardamom pods, curry leaves and pandanus leaf. Stir for 5 seconds, then add the meat. Stir and fry until the meat is browned on all sides. Reduce the heat to medium and add the spice mixture from the coffee grinder. Stir for a minute. Now add the mixture from the blender. Stir and fry for 5 minutes. Add 600ml water, 1/2 teaspoon turmeric, lemon juice and salt. Stir to mix and bring to a simmer. Cover and cook on a very low heat for about 1 hour 20 minutes for beef, 60-80 minutes for lamb and pork. Stir once or twice during this period. Add the coconut milk and heat through. Check for salt, adding a bit more if needed. The Chinese love to have prawns on the dinner menu during Chinese New Year. Prawns are called "har" in Cantonese and it sounds like laughter, as in hahaha, which, of course sounds merry and happy, a good start to a new year. Whatever it symbolizes, prawns are delicious and quite expensive during the festive occasion, especially so when a prawn dish is on the menu from the Chinese restaurants. I have stocked up on some prawns before the festive season starts, and now that I'm back home after the holidays, it's time to bring some "har" to my dinner table at home. Since prawns are a favourite in my house, you can be assured of lots of "hahaha and smiles" when these are served. This is a very simple and easy fried prawn dish. Last weekend, I've visited my sister and harvested from her garden a big bunch of lovely Thai basil leaves from her very lush basil plant. Thank you sis, the basil leaves are extremely fragrant! My family enjoyed this dish a lot! We love the wonderful smell and taste of the crispy minced garlic and the fragrance from the basil leaves. Prawns have their own unique flavourful taste, and would be extremely delicious with the right amount of seasoning, so adjust the seasoning to your taste. Best eaten with your fingers! It is fingers licking good! Marinate prawns with 1/4 tsp salt, 1/2 tsp sugar and a generous sprinkling of white pepper powder. Keep aside, covered for 15 minutes. Drain. Heat about 1/2 cup oil and fry prawns in one single layer, 2 minutes per side until cooked. Remove and drain. You may need to do this in a few batches. Remove oil from wok, retain about 2 tablespoons of oil in wok. Saute the chopped garlic until light brown, crispy and fragrant. Add in all the pre-fried prawns and a pinch of salt to taste. (You may add in more white pepper powder and sugar to taste if desired). Stir fry until prawns are coated with the fragrant chopped garlic about 1 minute. Add in the basil leaves, stir to combine for a minute more or until leaves are wilted and fragrant. Dish out to a serving plate. Enjoy! I'm sharing today, a herbed pumpkin roll which I've made a few weeks ago. Clearing my pantry : from the freezer, pumpkin puree. I am slowly clearing my freezer, I have bookmarked many recipes which I intended to try, to use up all that frozen egg whites "hibernating" in my freezer, some frozen berries and pumpkin puree too. 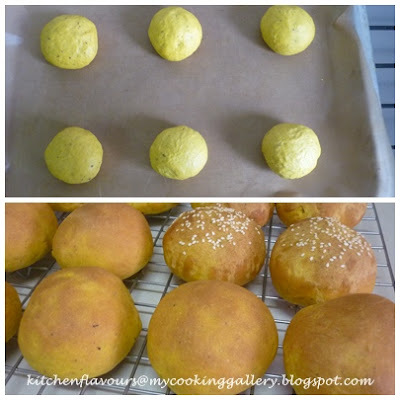 There are quite a number of recipes using pumpkin puree which I've bookmarked, and since I wanted some buns or rolls for our sandwich at lunchtime, I decided to make these Herbed Pumpkin Rolls. I've use my homemade pumpkin puree which I've frozen in 1-cup containers. Simply thaw the frozen pumpkin puree in the refrigerator overnight, place your frozen pumpkin puree container on a plate to catch any excess moisture. The dough for the rolls is kneaded in the bread machine, right up to the first rising. Then the dough is removed, proceed with the shaping of rolls and final rising before they are baked. The dried herbs used are basil and thymes. I have omitted the black pepper. This recipe makes 12 rolls. I've made 6 rolls with sesame seeds scattered over the top and leave the other 6 plain. I brushed the top of six rolls with some melted butter and scatter the sesame seeds on top. The seeds do not stay in place for long, after baking, most of them fell off. Next time I'll leave the buns plain, they look much nicer that way too! We had the rolls eaten as burger buns sandwiched with fluffy egg rounds. Eggs are beaten lightly with a pinch of salt, coarse black pepper powder, some chives from the garden, a tablespoon of milk, grated cheddar cheese and some chopped sandwich ham. 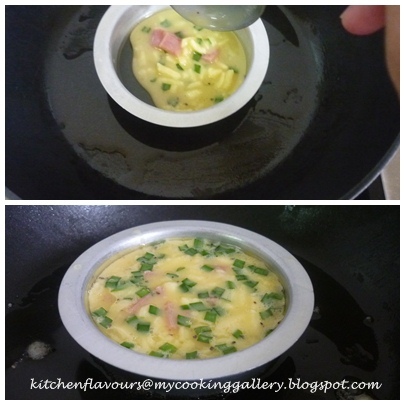 These are cooked using the egg ring mould, refer to the instructions from the recipe below. It has a soft texture and a gorgeous sunny colour from the pumpkin. A soft, nice golden brown crust. Herbed Pumpkin Roll with Fluffy Egg Round, garnish with some slices of cucumber, tomato and add your favourite mayonnaise, chili sauce or mustard, your choice! My kids had slices of cheese in between. The rolls are not as soft on the second day, simply cut them in half, as above, spread with a little butter on the cut surface and heat them up in a frying pan over very low heat for a few minutes, they will be very soft once again. Add your favourite filling and enjoy your breakfast. We had the rolls with some sliced ham the next day. In a small saucepan, scald milk over medium-high heat, until small bubbles form around the edges. Remove from heat and stir in brown sugar and butter. Transfer to the bread pan and let cool to lukewarm (between 86F and 95F/30C and 35C). Add salt, basil, rosemary, pepper, egg and pumpkin to the bread pan. Spoon flour on top of liquid. Add yeast. When the cycle is finished, transfer dough to a floured surface and punch down gently. Divide dough in half. Cut each half into 6 pieces. Roll each piece into a ball. Place at least 2 inches (5cm) apart on prepared baking sheet. Cover with a clean towel and let rise in a warm, draft-free place for 30 minutes. Meanwhile, preheat oven to 375F (190C). Bake for 15 to 20 minutes or until risen and browned and an instant-read thermometer inserted in the center of a roll registers 190F (90C). Beat eggs and salt lightly. Add in the rest of the ingredients, beat lightly to combine. Brush egg ring mould all over with oil to prevent eggs from sticking to rings. Heat a saucepan over medium-low heat, brush with base with oil. Place egg ring mould on saucepan and heat for a minute. Scoop some egg mixture into ring mould until almost full, it will puff up a little later on. Turn heat to lowest setting, cover saucepan and let cook for about 3-4 minutes or until egg has set. Slowly but gently turn ring mould over and cook the other side of egg for another minute or two. Remove ring mould. Remove egg to a plate. Serve immediately with your favourite rolls or buns as a sandwich filling. Strawberry Yoghurt Ice Cream / Gong Xi Fa Cai !! Strawberry Yoghurt Ice Cream, delicious, refreshing, yummy! Slice the strawberries and toss them in a bowl with the sugar and vodka or kirsh, stirring until the sugar begins to dissolve. Cover and let stand at room temperature for 1 hour, stirring every so often. Pulse the strawberries and their liquid with the sour cream (or yoghurt), heavy cream and lemon juice in a blender or food processor until almost smooth but still slightly chunky. I will be taking a break for the coming Chinese New Year. Most of us will be travelling and visiting our loved ones, I wish you a safe journey to your destination and a safe journey back home! See you when I get back! Wish you good health, prosperity, longevity, lots of good luck and happiness! And have a blessed wonderful year! Sweet and sour pork is a favourite dish among my kids and their cousins. They love this dish with lots of sauce which is made up of tomato ketchup and other ingredients. Whenever we meet up with my sisters and their family for a dinner at any Chinese restaurants, the kids would request for Sweet and Sour Pork, each time! This is definitely a different take from the usual Sweet and Sour Pork which we have at Chinese restaurants and the one that I usually cook at home, so I thought that I'd give it a try. This recipe does not use any tomato ketchup or other sauces, instead it uses the juices from the canned pineapple chunks for the sauce, with the addition of brown sugar, rice vinegar and some seasoning of salt and pepper. The meat is marinated with a simple mixture of cornflour, eggs, salt and pepper, which are then deep-fried till browned and cooked. You could however use chicken fillet. The peppers are then stir-fried briefly, and the sauce is added in, thicken slightly, and finally, in goes the pre-fried meat, mix everything in a quick stir, dish out and serve hot with rice. Even though there's not much sauce, it is quite nice. Thumbs up from the kids! I would use a bigger can of canned pineapples the next time, firstly, for more sauce and secondly, we love the pineapples! By the time everyone dig in for the pineapples, there are none left on the plate! This simplified version is a nice choice for a simple weekday dinner. 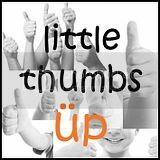 Little Thumbs Up, an event hosted by my baking buddy, Zoe from Bake For Happy Kids and Doreen from my favourite diy where the selected ingredient for this month is "Pineapple". Pineapple! My pineapple plant has a small fruit growing. Now I've got to be patient and waif for a few more months, for the harvest! Did you know that it takes about 200 flowers or more, to create this wonderful fruit? Have you seen the flowers of a pineapple before? If not, I'm happy to share with you the pictures of the small light purple beauties taken from my pineapple plant from my potted garden, to view the flowers, click here. Heat a wok over a high heat, then fill the wok to one-third of its depth with groundnut oil. Heat until the oil glistens and when a small piece of bread dropped in turns golden brown in 15 seconds and floats to the surface. Using a spider of slotted spoon, carefully add the pork to the oil and fry for 3-4 minutes until golden brown. Lift out using the spider of spoon and drain on absorbent kitchen paper. Pour the oil from the wok through a sieve into a heatproof container and save to use later. Return 1 tablespoon oil to the wok and heat until smoking, then add the ginger and pepper chunks and quickly stir in to stop the ginger from catching. Stir-fry for 2 minutes, then add the pineapple and its juice and bring to the bubble over a high heat. Season with soy sauce, vinegar and brown sugar, if using. Then, as the liquid in the wok reduces and boils, add the blended cornflour and stir to thicken. Return the pork to the wok, stir and toss together well so the pork is covered in the sauce, then serve with egg-fried rice. I was flipping through one of my local cookbooks looking for ideas on dinner, found this simple Claypot Chicken with Chinese Sausage. Since I have all the ingredients, I made this for our dinner that night. This would be a nice simple dish to serve the family for the coming festive Chinese New Year. Simple and very tasty. Simple, delicious and a hit with the family. I pan-fried an extra sausage and used that for extra garnish just before serving. The chicken is braised over low heat, covered for about 20-25 minutes until cooked and tender. Adjust the seasoning to your taste. This dish is also great for a weeknight dinner, get everything ready in the morning, keep in the refrigerator, and do the cooking later in the evening, quick, easy and very tasty. Once the chicken is cooked and tender, stir in some spring onions. Garnish with more spring onions and top with the pre-fried sliced Chinese sausage just before serving. Since I have lots of spring onions in my garden, this is a delicious way of using them. Heat about 1 teaspoon of oil in wok or saucepan over very low heat. Add in one whole Chinese sausage, stir for a couple of minutes until cooked and casing is blistered. Remove from heat and keep aside. When cool enough to handle, discard casing and slice the sausage thinly at a diagonal. Place in small bowl, keep covered and put aside. Heat up 2 tablespoons oil in claypot, saute garlic and shallots until fragrant. Add in chicken pieces and stir for a few minutes until chicken turns white. Add in the uncooked sliced Chinese sausages, button mushrooms, hot water and seasoning. Stir to combine. Bring to a boil. Cover claypot, reduce heat to low and continue to braise over low heat for about 20 minutes, stirring two or three times in between. Adjust seasonings to taste. Turn off heat when chicken is cooked and tender, stir in the spring onions. Just before serving, garnish with more spring onions and top with the sliced sausages from no. 1 above.